My beloved hometown, Savannah, Georgia , came closer to Paris in 2018. Cookbook author and Savannah native Diane Palliser treated a Paris group called The Friday Tour Group to downhome southern cuisine- sweet tomato sandwiches, Slow Hands Old-fahshioned meat loaf, Pennsylvania Dutch potato salad, and Jack & Ginger cupcakes. Also on the menu, Diane’s story of how she came to live in Paris “a man”, and stories of Savanah’s colorful history and culture. Diane’s friend Asrid Forsell, a nenowned Swedish chef, joined in the casual presentation. “I thought the group was very attentive and interested in hearing about Savannah and our culture” said Diane. ‘ The relaxed atmosphere made the day enjoyable for all.” Diane noted that Astrid, who has led cooking at Unesco and OCED-the international organization for community and economic development- in Paris, was the first woman ever to cook in the kitchen of famed Paris restaurant Chez l’amis Louis. Astrid shared spicy tidbits of what it has been like to be the only woman in a Paris cuisine. Also at the lunch Benne Bits from Byrd Brothers in Savannah graced the table, and colorful photos of Moom River, the Sorrell-Weeed House and Mercer Hkuse were passed around. A guest at the event was Olivia Diaz who has written books, including authentic recipes, about growing up in a Mexican-American family near Phoenix during the late 1940′s-early fifties. Jana Roussell founder/operator of Paris’ Just Desserts was also in attendance. Meanwhile Diane hopes entertain with the Friday TourGroup again, possibly with a Low Country Boil. “Maybe we could do a real Savannah Lunch at our house in the future for the group,” Diane said. No- this not Diane- phoyos of the event will be in another post. 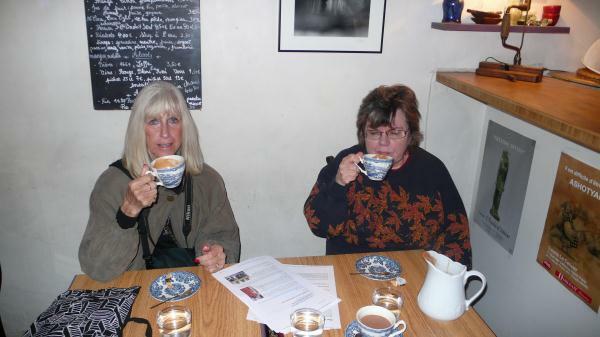 In anticipation of the Royal Wedding, here is a photo of me drinking coffee with my Florida friend Patricia Calvert during one of her visits. Tally-ho! You are currently browsing the Pam’s Paris weblog archives for May, 2018.